GoPro is a brand that is infamous in the action sport world, for over a decade GoPro have documented with skill the action adventures of people around the world, and they have done it with style. In this review we look at GoPro’s latest offering, the Go Pro Hero 3+. 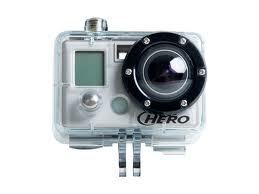 Have the ultimate experience, get the Go Pro Hero 3+. The Go Pro Hero 3+ builds on previous models success (and there sure has been some success in the GoPro range, as it has proven to be the number one action camera of choice). The Go Pro Hero 3+ obviously adds to the Go Pro 3, offering a few additional features that make quite a noticeably difference. The Go Pro Hero 3+ offers new optics, a new ‘SuperView’ mode, increased battery life and a slimmer design; impressive right? Well all of this is for the exact same cost as the Go Pro Hero 3. On the face of it, the camera looks remarkably similar to the previous model, asides from the small plus sign. It’s still waterproof yet they’ve managed to slim down the design considerably. Additionally it features buttons that are oh so easy to handle through whatever gloves you may be wearing for your chosen sport. As for the technical performance, well, where do we start? For a kick off it offers a wide variety of shooting modes and frame rates; as with any camera the higher the resolution you shoot in the lower the frame rate. All in all the GoPro Hero 3+ really is the action lover’s camera of choice. Generally speaking GoPro produce a wide variety of cameras, and even the most basic offers a pretty amazing spec. The latest standard offerings are the Go Pro 3 and the Go Pro Hero 3; the former of which range from £199 and the latter of which from £280. Each have near identical designs, but differ in terms of the shooting performance and waterproof levels. The GoPro Hero 3 has a range that is 20 metres further than the Go Pro 3. The Hero 3 provides resolutions of up to 1080p30, 5MegaPixel photos of up to 3 frames per second;Whereas the Hero 3+ offers video resolutions of up to 1080p60, 10MegaPixel photos of up to 10 frames per second, enhanced low-light performance and built-in Wi-Fi. If you’re an action sport lover of any variety then the Go Pro range is most certainly for you, in fact if you don’t own one already, then where have you been? The Go Pro Hero 3+ offers the ultimate in action shooting experience, but the rest of the range fairs pretty well to!